The LXE Tecton has been renamed to the Honeywell Tecton. The LXE Tecton is light enough for scan-intensive picking, yet able to take a beating with a rugged IP-65 rating. And now, turbocharged with a PXA320 806 MHz processor, running available Windows Mobile 6.5 or CE 6.0. The Tecton handheld mobile computer moves your supply chain with the leading edge of warehouse computing technology. The Tecton's enhanced performance comes without sacrificing any of the field-proven ruggedness you trust. Keypads protect against airborne and spilled chemical agents and are epoxy-topped to fight wear. Electrical components are soldered and glued to printed circuit boards to better withstand drops and shocks. The options for deploying the Tecton are practically limitless, with LXE's proprietary ToughTalk technology for voice-driven applications, available vehicle mounts, and a host of other accessories, all backward compatible for existing installations. BASE LSR, 55/P-BKSPC, 256 /256, CE6.0,802ABG+Bluetooth, RFTERM. Non-Cancelable/Non-Returnable. BASE LSR, 55/P-BKSPC, 256 /256, CE6.0,802ABG+Bluetooth. Non-Cancelable/Non-Returnable. BASE LSR, 32 key, 256/256 CE6.0,802ABG+Bluetooth. Non-Cancelable/Non-Returnable. Handheld COMPUTER, BASE LASER SE955E, 55 key ANSI, 256MB RAM, 256MB FLASH, COLOR DISPL, TOUCH, WIN MOBILE 6.5, NO APP, NO CUST OPT, US, 802.11a/b/g+Bluetooth, DUAL Internal Antenna. Non-Cancelable/Non-Returnable. 1D BASE LSR, 802ABG+Bluetooth, CE6.0,55/ANSI, 256/256, NO APPS. Tecton, 2D imager, 55 key alpha, ANSI, 256MB RAM/256MB flash, 802.11a/b/g, Bluetooth, CE 6.0, re term, US. Includes battery, stylus and handstrap. Interface cables and charging cradle sold separately. Single slot charging cradle (Part# MX7003DSKCRDL) and communication cable (Part# MX7052cable). Quad slot charging cradle (Part# MX7390CHARGER). HANDHELD MOBILE COMP, 2D AREA IMAGER, 55 key ANSI, 256 MB RAM, 256 MB FLASH, COLOR TCH DISP, CE 6.0 ENG, NO APP, NO CUST OPT, US, 802.11a/b/g + Bluetooth, DUAL Internal Antenna. Non-Cancelable/Non-Returnable. 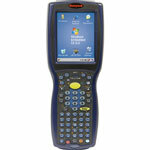 SHRT LSR, 55/5250,256/25 6, Windows CE6.0, RFTERM, 802ABG+Bluetooth. Non-Cancelable/Non-Returnable. MX7, Wireless Handheld Computer (MX7T, SE955I, 55/ANSI, 256/256, CE 6.0, No RF Term, 802.11a/b/g, Bluetooth). Non-Cancelable/Non-Returnable. Tecton, Wireless Handheld Computer (Lorax, 802.11a/b/g, Bluetooth, 32 key, Windows CE6.0, 256/256, RF Term). Interface cables and charging cradle sold separately. Single slot charging cradle (Part# MX7003DSKCRDL) and communication cable (Part# MX7052cable). Quad slot charging cradle (Part# MX7390CHARGER). Tecton, Handheld Computer, Multi-Range "Lorax" Laser, 1524ER, 55 key ANSI, 256MB RAM, 256MB Flash, Color Display, Touch, Windows Mobile 6.5, no App, no Cust OPT, US, 802.11a/b/g+Bluetooth, Dual Internal Antenna. Interface cables and charging cradle sold separately. Single slot charging cradle (Part# MX7003DSKCRDL) and communication cable (Part# MX7052cable). Quad slot charging cradle (Part# MX7390CHARGER). Tecton, Wireless Handheld Computer (Lorax, 802.11a/b/g, Bluetooth, Windows CE6.0, 256/256, WLINK TE+3 year). Interface cables and charging cradle sold separately. Single slot charging cradle (Part# MX7003DSKCRDL) and communication cable (Part# MX7052cable). Quad slot charging cradle (Part# MX7390CHARGER). Tecton, Wireless Handheld Computer (Lorax, 802.11a/b/g, Bluetooth, 55 key, Windows CE6.0, 256/256). Interface cables and charging cradle sold separately. Single slot charging cradle (Part# MX7003DSKCRDL) and communication cable (Part# MX7052cable). Quad slot charging cradle (Part# MX7390CHARGER). Tecton, Handheld Computer, Base Laser SE955E, 32 key Numeric, 256MB RAM, 256MB Flash, Color Tch Disp+Defroster CE 6.0 US ENG, Rfterm Te, No Cust Opt, US, 802.11a/b/g+Bluetooth, Dual Internal Antenna. Non-Cancelable/Non-Returnable. Interface cables and charging cradle sold separately. Single slot charging cradle (Part# MX7003DSKCRDL) and communication cable (Part# MX7052CABLE). Quad slot charging cradle (Part# MX7390CHARGER). CS: SHRT LSR, 55 key/5250, 256/256, CE6.0, RFTERM, ABG+Bluetooth. Non-Cancelable/Non-Returnable. Tecton, Handheld Computer, Multi- range "LORAX" Laser, 1524ER, 55 key 5250, 256MB RAM, 256MB Flash, Color Tch Disp+Defroster CE 6.0 US ENG, No App, No cust opt, US, 802.11a/b/g+Bluetooth, Dual Internal Antenna. Non-Cancelable/Non-Returnable. Interface cables and charging cradle sold separately. Single slot charging cradle (Part# MX7003DSKCRDL) and communication cable (Part# MX7052CABLE). Quad slot charging cradle (Part# MX7390CHARGER). Tecton, Mobile computer, 802.11a/b/g+Bluetooth, Dual Internal ANT, 55 key ANSI, Near Far Laser, 256MB RAM, 256MB Flash, WIN Mobile 6.5, RFTERM, US. Interface cables and charging cradle sold separately. Single slot charging cradle (Part# MX7003DSKCRDL) and communication cable (Part# MX7052CABLE). Quad slot charging cradle (Part# MX7390CHARGER). Tecton, Cold Storage Computer, Lorax Scanner, 55 key ANSI, 256MB RAM/256MB FLASH, Color Display With Optional Defroster, 802.11a/b/g+Bluetooth, Dual Int A/B/G Antenna, CE 6.0, Wavelink Te 5 years, No custom, US. Interface cables and charging cradle sold separately. Single slot charging cradle (Part# MX7003DSKCRDL) and communication cable (Part# MX7052CABLE). Quad slot charging cradle (Part# MX7390CHARGER). Tecton, 2D imager, 55 key alpha, ANSI, 256MB RAM/256MB flash, 802.11a/b/g, Bluetooth, CE 6.0, 1 Year wavelink te, US. Includes battery, stylus and handstrap. Interface cables and charging cradle sold separately. Single slot charging cradle (Part# MX7003DSKCRDL) and communication cable (Part# MX7052cable). 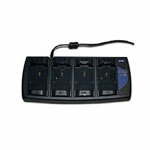 Quad slot charging cradle (Part# MX7390CHARGER). LXE products have a reputation for being rugged devices for hardened environment and the Tecton is no exception. With an IP65 rating, the Tecton can handle drops, tumbles, and most anything else you put it through in a streamlined design. The Tecton also comes standard with ToughTalk technology for easy integration with voice-driven applications. 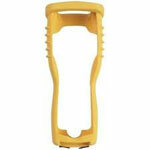 This is a unit made for picking applications and anywhere else in the supply chain. In a users hand or mounted to a forklift, the Tecton can be the one device to serve all parts of your business. Other mobile computers may seem to be less costly, but with a high IP rating and extensive application support, the Tecton is the superior device in the long run. For the business that requires peak performance and flexibility, the Tecton is the mobile computer that will always deliver.